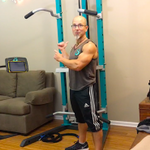 Although this video is a little rough around the edges, it NEEDS to be in here and part of this program because I recorded this session WAY BACK when I had the first prototype of the SCULPTAFIT Home-Gym built (I called it The Atlas Unit back then). So, you'll notice that and you'll see "how far we've come" since then. Seeing this video and including it here really makes "the dream" hit home for me. Back then, at first I didn't have a vision of bringing things to where that are today - with YOU reading this right now, being an important part of the "movement". I kept those thoughts down - fear and "life" kept them down... But, after enough people kept telling me "you need to do something with this - a LOT of people can benefit from this system and you can help so many people..."
I realized they were right and that deep down - I REALLY wanted that to become a reality. Fast forward over 10 years - and NOW LOOK! It is a REALITY. So, I thank you for being here and being part of what only used to be a vision and a dream of what the future might hold. YOU are an important part of "this whole thing".